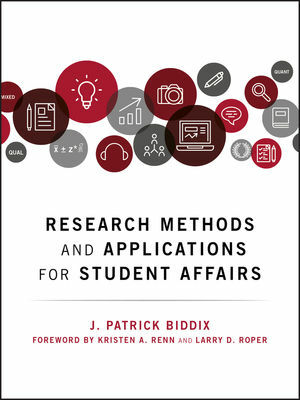 Research Methods and Applications for Student Affairs offers students and professionals in the field an authoritative and accessible guide to help navigate research in student affairs. This comprehensive resource on research methods instruction clearly shows how to interpret the various forms of research, how to be critical as a research consumer, and how to use research to inform practice. Author J. Patrick Biddix—a noted scholar and expert in the field—presents a detailed overview of three qualitative-focused and four quantitative-focused research methods. The text reviews the basics of these qualitative and quantitative approaches and explores how to differentiate the major types of research as well as how to understand, read, evaluate, and apply results. Biddix also includes important information on using mixed methods approaches. The user-friendly text includes insights on key issues, as well as descriptions of the individual sections that comprise research studies. Also included is an overview of ethical considerations that apply specifically to student affairs. Research Methods and Applications for Student Affairs is an essential guide for enhancing research methods' skills, and offers direction for applying those skills in actual work situations. J. PATRICK BIDDIX, PHD, is Professor of Higher Education and Associate Director of the Postsecondary Education Research Center (PERC) in the Department of Educational Leadership and Policy Studies at the University of Tennessee. He teaches graduate courses in research, assessment and evaluation, and special topics in higher education and student affairs. In 2015, he received a Fulbright Award to conduct research at Concordia University in Montreal, Canada. His areas of expertise include research design and assessment and postsecondary outcomes.